The latest enhancements on the Ask Izzy website, aimed at providing better, safer family violence support, are a reminder of the role technology can play in supporting some of the most vulnerable people in society. Many women may not recognise they are in a family violence situation. But they understand when their safety is threatened. When the time comes for them to leave, there may have been no planning, nor time to think about where to go or what to do next. This premise underlies many of the latest enhancements to Ask Izzy. Ask Izzy is a mobile website, developed by Infoxchange, that connects people who are in crisis with the services they need “right now and nearby”. It was co-designed with people who are experiencing homelessness. Data shows that people leaving family and domestic violence are one of the biggest users of Ask Izzy. With this in mind, a new raft of enhancements to the site aims to provide better, safer family violence support as well as help people who may not realise that they are experiencing family violence, find general assistance with housing, food or other essential services. 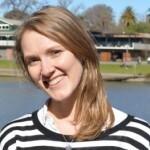 Infoxchange social innovation and digital inclusion manager Jess Perrin says while family violence remains an incredibly complex issue, the enhancements are a perfect example of how technology can be used to support people in crisis. “We know from our research and co-design with people who have experienced family violence that trying to find help can be overwhelming,” Perrin says. “Some people may not even realise that they are experiencing family violence, so they won’t necessarily go looking for family violence support – their main priority might be to just find housing or groceries. Safety is front and centre of the enhancements. The first question you are asked is “are you safe right now?” Depending on the answer given – yes, no, or maybe – users will be directed to call triple zero, to call 1800RESPECT, or be provided with a list of services that they may need. The new features include a quick exit button, a new domestic and family violence search category, emergency numbers and best practice tips and warnings about safely using technology. It comes as the result of a two-year project funded by the NAB Foundation, which included a co-design process with service providers and people with a lived experience of family violence. Perrin says the co-design process was key to achieving their goal. “It’s that quote I’ve heard so many times, nothing for us without us. And that is what we heard in co-design,” she says. Perrin says there is nowhere on Ask Izzy that states it is designed for people experiencing homelessness or people experiencing family violence. But the feedback from the co-design process was that “they know that when they see it”. “To me that was kind of a real lightbulb moment,” Perrin says. “Some of the feedback on [the quick exit button] was ‘well I’m probably not going to use the quick exit button as I’m just going to press the home screen on my phone, that’s going to be quicker to me. But there is such safety in knowing that that is there and that this product has been designed for me’. 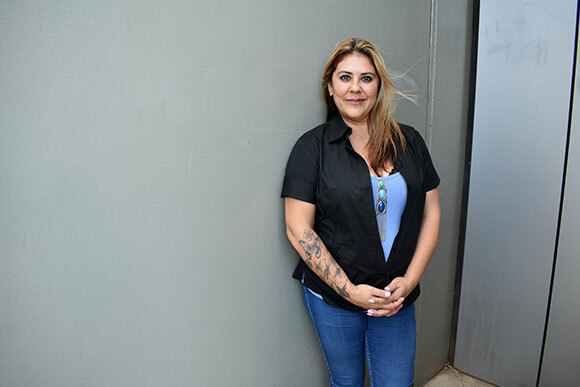 Vicky Vacondios, who spent years navigating the service system after leaving a violent relationship, is one of the survivors who contributed to the co-design process. She says Ask Izzy would have saved her from numerous setbacks on her journey to safety, including being turned away by a housing service at the last minute on a technicality, and could have halved the years she was caught “in and out of a vicious cycle”. “I actually broke down into tears and felt so alone and lost for a moment. If Ask Izzy had been available, I wouldn’t have been in that situation and I would have saved myself the energy and time,” Vacondios says. She says something as simple as a quick exit button could be incredibly important. “For women who are experiencing domestic violence, lots of times if you are on your phone, the perpetrator wants to know who are you messaging, and then the aggression starts. Are you going to go see someone? Automatically the perpetrator’s insecurities kick in… and that’s when they come and storm over you and the phone wrestling starts,” she says. Being caught looking for support services could be very risky, as it may signal you are planning to leave or that you are talking to other people about what is going on at home. “Straight away that would be a retaliation and anything can happen from that,” Vacondios says. She says asking users if they are safe was also key and could help “plant a seed”. “A lot of women if they’re in a controlled environment they’re not listening to the news, they’re not going out into the community, they’re not listening to anything out there, how are women even supposed to know what domestic violence is?” she says. Vicky Vacondios and Jess Perrin at the launch of the enhancements. Perrin says the project speaks to Infoxchange’s overall mission of “technology for social justice”, which can be broken into three key streams of work. One is around digital empowerment, which is where products like Ask Izzy sit, the second is digital skills training to stop people being left behind by the digital divide, and on the other end of the spectrum they work to build the capability of the not-for-profit sector to use technology to improve their work. “When I think about that intersection of technology and social impact, I’m really excited by that future,” Perrin says. 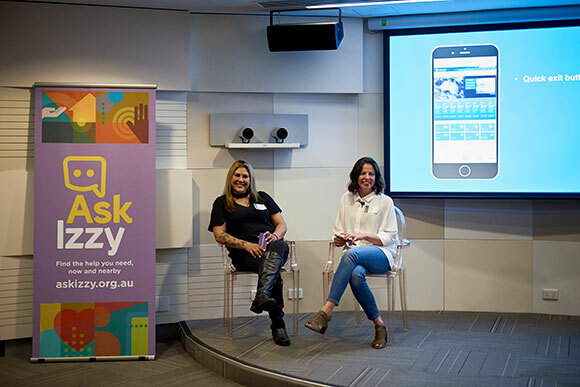 When Ask Izzy was first built in 2016, in partnership with Google, realestate.com.au and News Corp Australia, to connect people who are homeless, or at risk of being homeless, with service providers, Perrin says they hoped they would see 100,000 searches in the first two years. Since then there have been more than 2 million searches for help on the site. Perrin says this is a dual-edged sword. “It’s disturbing to know that there’s that much level of need in Australia, but at the other end of the spectrum, this is one of the first products that has been designed by and for people with lived experience of homelessness,” she says. She says it’s also interesting to note that Ask Izzy wouldn’t have worked a decade ago, because we weren’t all walking around carrying a smartphone and a tiny computer in our pocket. “Now we are. And 80 per cent of people who are homeless have a smartphone, so it is a lifeline for them. It is a vital support tool to help them connect to services which they need, and that has never been seen before,” she says. Vacondios says she is excited to see the launch of the latest enhancements. “Because this can actually save lives, not just of women but women and their children,” she says. “It stands out. There’s nothing out there like Ask Izzy.